OYSTER PERPETUAL Day-date 36. The watch of prestige. VI and IX in 18 ct gold set with diamonds. 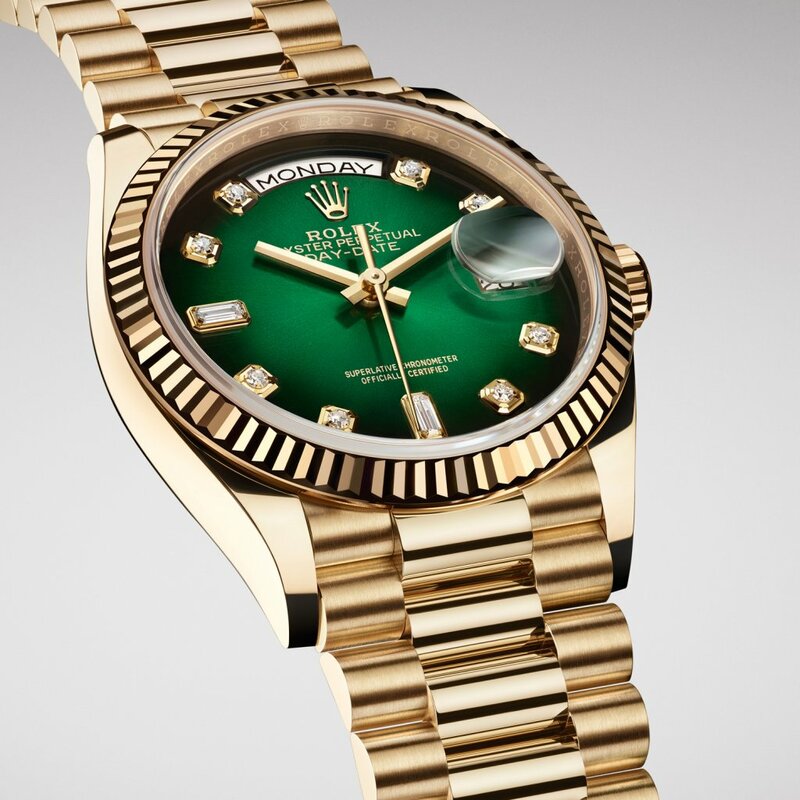 The bezel is adorned with 52 brilliant-cut diamonds. The last watch, in 18 ct white gold, is yet more precious. Its dial, featuring hour markers fashioned from ten baguette-cut sapphires in rainbow colors, is entirely paved with diamonds. Its bezel is illuminated by 52 brilliant-cut diamonds and its bracelet is set with 412 brilliant-cut diamonds along the centre links. Perpetual Day-Date 36 for the first time. 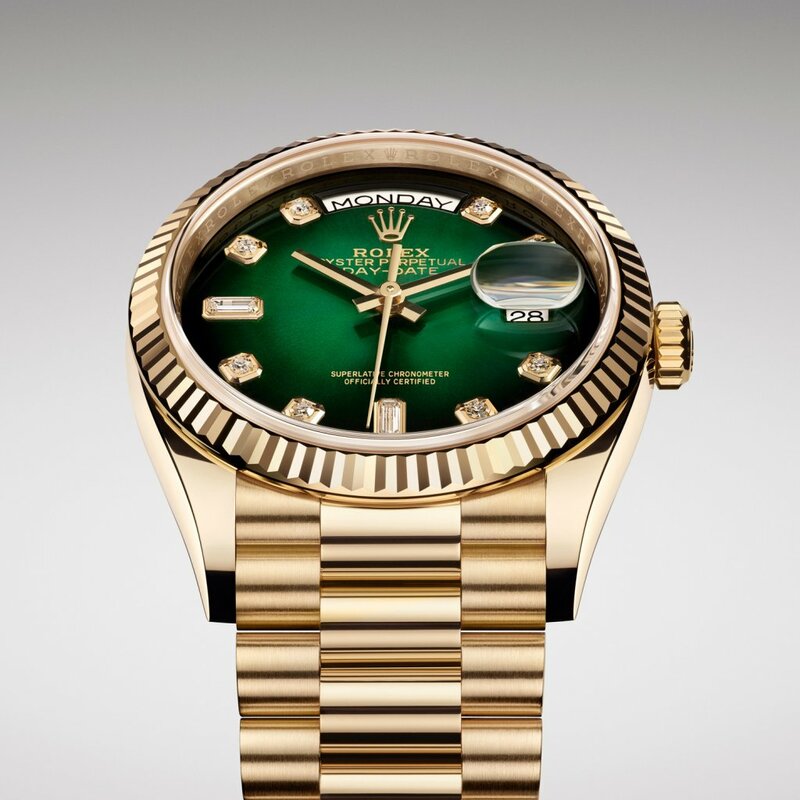 Like all Rolex watches, the new Oyster Perpetual Day-Date 36 versions carry the Superlative Chronometer certification, which ensures excellent performance on the wrist. 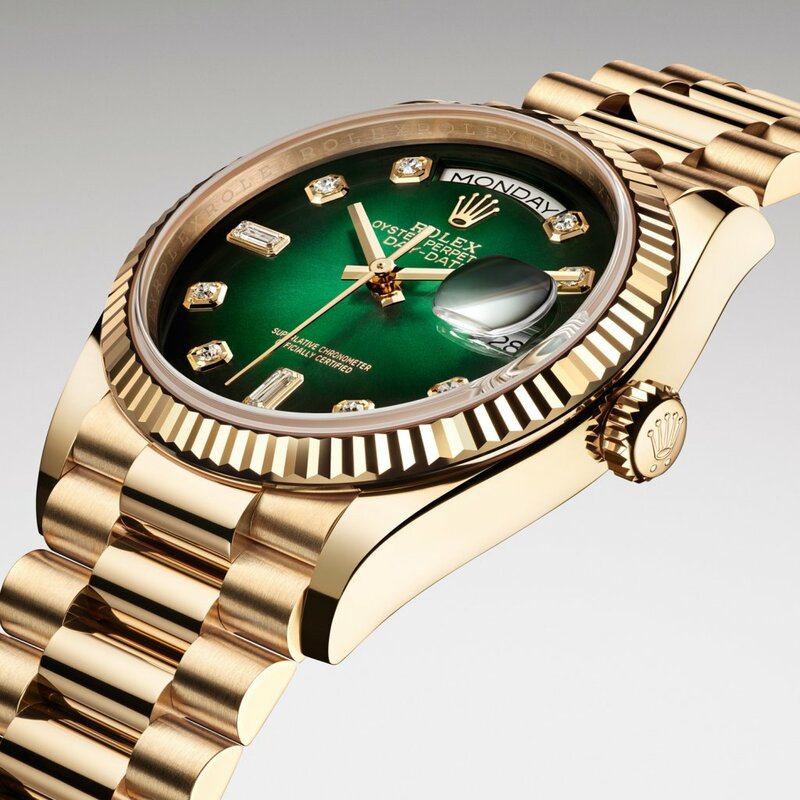 Day-Date became known as the “presidents’ watch”. white or Everose gold. The case back, edged with fine fluting, is hermetically screwed down with a special tool that allows only Rolex watchmakers to access the movement. The winding crown, fitted with the Twinlock double waterproofness system, screws down securely against the case. The crystal is made of virtually scratch proof sapphire and is fitted with a Cyclops lens at 3 o’clock for easy reading of the date. The waterproof Oyster case provides optimum protection for the Day-Date 36’s high-precision movement. Like all models in the prestigious Day-Date range, the Oyster Perpetual Day-Date 36 is made only of precious metals. 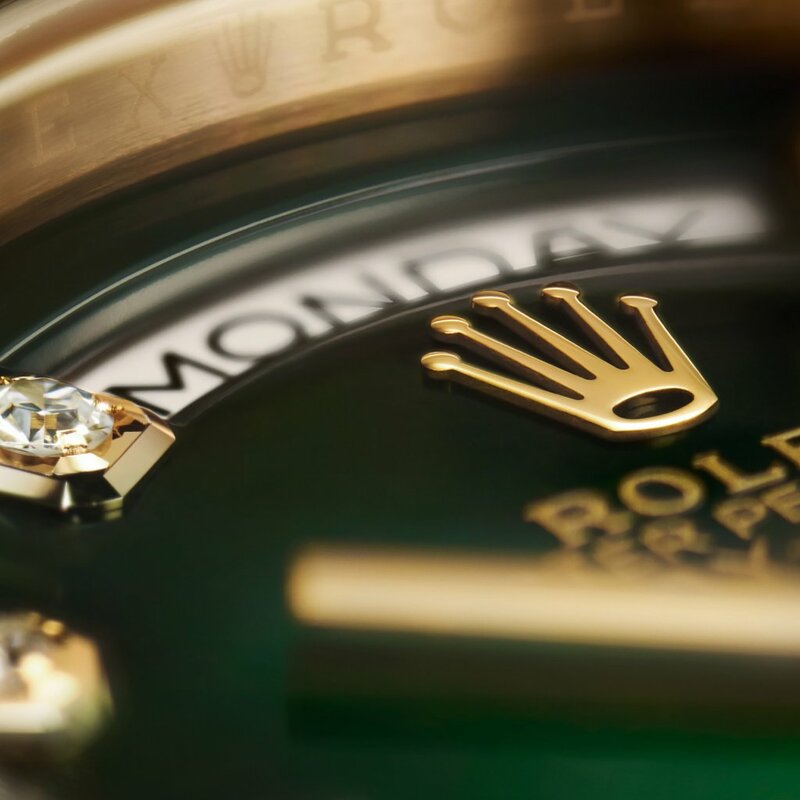 In addition to the date, it indicates the day of the week spelt out in full in a window on the dial. versions of the Datejust. On these new versions, the President bracelet is equipped with an elegant concealed folding Crownclasp and includes ceramic inserts inside the links to enhance its flexibility and longevity. between the bracelet and case. that required of an official chronometer. 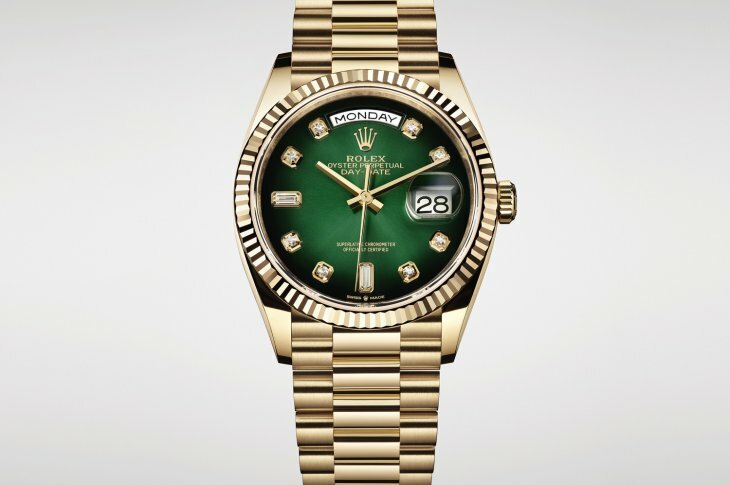 The Superlative Chronometer status is symbolized by the green seal that comes with every Rolex watch and is coupled with an international five-year guarantee.